In the town of Dunlowe, being different can be deadly. No one knows this better than the seven girls born on the exact same day, at the exact same time. From birth, they've been feared, judged, and controlled. And yet, still loved by their families. Still hoping for a future. Still believing that acceptance would one day come. As their seventeenth birthday approaches, events occur that leave Cecily Daye and the other girls grasping with the possibility that their oppressors might have been right about them all along. Maybe they are as evil as the town has believed. But without an answer, they must make a choice when the town turns on them: to die or to run to the one place no person would follow—they must enter The Wild Wood. I was supposed to be feeding the goats. I was supposed to be anywhere but lurking beneath a slightly open window, getting raked by a thorny rosebush, all to eavesdrop on my parents and the man who had cursed every day of my life. Although this round of danger had passed, tomorrow was a new day to fail and hurt everyone I loved. Even in my bed, I didn't feel safe from the people who hated me. The walls weren't strong enough, the door not locked - nothing could keep them out if they ever really decided that the Sevens didn't belong in the world. I got up and looked out the window. Oh good, a posse, with burning tourches. Nice. "I know you do her a disservice. She has the right to know who she is and what is to come. She has the right to know what she will lose. I know we've had this argument before, but she, Cecily Daye, has the right to choose to walk away from all of this." "Gosh, there's just no good way to kill things," I said with some confusion. When Tiffany at Escaping... One Book @ A Time a first approached me to participate in the book blog tour, I jumped at the chance. She raved about this book and how amazing the story and writing was; once I read the premise, I knew I had to read this novel as well. And I am so glad she invited me to join! Cecily lives in a small town as a member of the Sevens: Seven girls who were born on the same day at the same time. Because of this Pastor Rowe has branded them evil. They cannot associate with one another and are essentially ostracized from the town. They have a set of rules - "traditions" - they must follow and if they break any of them, there are pretty severe replications. Their 17th birthday is approaching and this is when Pastor Rowe states that they will truly come into the evil power and should be feared. Nelson does an amazing job of describing the town, its inhabitants, and the lives these girls have had to live. The characters come alive and, in earlier times, I can see something like this happening. Well, the first half on the novel anyway. I can't speak much for the people of Dunlowe. They're all too afraid of Pastor Rowe to rebel against him. The families love and care for their daughters, but they still don't do anything. I guess I get it. They're afraid and Pastor Rowe can easily turn anything positive about the Sevens into a negative - as we see a couple times. There isn't much in the way of romance. Cecily is dating Nate, son of Pastor Rowe, and I cannot stand him. "I love you, Cecily and I don't care what my father says, but... I don't believe him at all, but..." Shut up. Go away. Now, I'm not bashing the novel or Nelson for any of this. These aspects keep the novel and time period believable. It doesn't make me hate the book, it makes me hate the character. Which I'm pretty sure Nelson is going for. Cecily is a wonderful character who protects her family as best she can. I commend her all the more because when it comes time to step up and actually protect them, and the other Sevens, she does so. She developed wonderfully through the novel - from a young girl to a true leader, but I won't get into that (far too many spoilers). Even the other Sevens (Stephanie, Morgan, Abigail, Amanda, Charity, and Millie) develop throughout the novel. They all have their own personalities, which I can imagine is a bit tricky when you have so many characters that play an integral part of the novel. One of my favorite aspects though is once they escape to the Wild Wood, they refer to each other as sisters. I love the camaraderie of these girls who never spoke, and barely looked at one another, who all become so close that you would have thought they were truly sisters. This novel was absolutely amazing and I had a hard time putting it down. The writing is beautifully done and the story captivating and unique, with enough surprises that I never found myself predicting what was going to happen next. I am definitely going to continue with Volume 2, The Downs. Welcome to Bookish, Julie! I'm so excited to have you here with us today! How would you describe the story of The Wild Wood to those who haven’t heard of it yet? First, thanks so much for taking the time to review The Wild Wood! The Wild Wood is the story of seven girls who were born at the exact same moment in a superstitious little town (think Salem, MA, during the witch trials, only a fantasy version). All of their lives, they are treated with fear and contempt, except by their families and friends, and when the town’s leader finally decides to act on his suspicions, the Sevens have to decide what to do: to fight or to run. And worse than that choice, they face the possibility that their oppressors might have been right about them all along. That's a pretty good set up to the novel. My favorite thing about how you just described is that your description only pertains to the first half of the novel. There are still so many secrets in store! Personally, I hate when the synopsis gives away too much, but that was the perfect amount. Could you tell us a little bit about the inspiration behind it? Years ago, when I was in college (one of the times... I tend to keep going back), due to school and work, I didn’t have the time or energy to launch into big projects like a full novel, but without writing, I’m a fairly grumpy person. So, I came up with a plan: I would write short projects, just three pages or so, that were inspired by famous quotes and later proverbs. I could write anything I wanted and didn’t have to have beginnings, middles, or ends—just whatever I felt like writing. Sometimes, I would keep going back to one particular story and others, I just yammered on about whatever for three pages (sometimes thirty). Years later, I was going back through the couple hundred stories and stumbled on one that still moved me. It later became The Wild Wood. The quote that started it all: “Away, away from men and towns, To the wild wood and the downs...” from The Invitation by Percy Bysshe Shelley. All of the books in the Sevens series are named after lines from the poem. For any writers out there, this project proved invaluable to me because it completely took away the fear of the blank page. You just fill it and see what you’ve got, and if you don’t like it, you try again. That's a pretty neat writing trick - and some invaluable information to future/aspiring writers. I want you to get real creative and describe your book in 5 words or less. Adventure, love, sacrifice, and self-discovery. Tell us about Cecily, your heroine? Cecily is a girl who really tries to follow the rules and really, really wants to be accepted (there are some pretty hefty penalties for her family if she doesn’t follow the rules), but more than that, she wants to understand who she is and why she was born. She constantly thinks less of herself, even when she’s being incredibly brave (she calls herself a chicken), and she can be pretty snarky when life takes unexpected turns. But when events in the town get dangerous, she’s the one the other Sevens look to and the one who is willing to risk everything to protect others. I think that Cecily continually calling herself a chicken and then seeing what she does for the other Sevens is really telling. Not just about her personality, but about her strength as well. It's a small tidbit that you threw in about her, but it speaks volumes. Additionally, each of the Sevens really had their own personalities and quirks. Was it difficult to make that many characters stand out from one another and be individuals, especially when they're such a huge part of the novel? I love books with a bunch of characters, but yes, working with such a big cast of characters is challenging. At times during the writing, I considered paring them down, but the characters went rogue and made themselves too interesting to get rid of. And now that I am writing the fourth book (coming this December), I am so grateful I kept them all. Each one was a distinct person to me and had a purpose in the series, even if we don’t know much about them in the earlier books. I'm always amused when characters go rouge within an authors imagine. I either picture them standing their ground sining "I'm not going anywhere" or running around while you try to catch them. Or in Stephanie's case, throwing a tantrum and pouting until you give up! What do you hope readers take with them after reading your work? That nothing is what it seems. Your best friend could have a frightening battle being waged inside her, and you might not know. A stranger on the street could need a smile. We never can really tell what’s inside a person, so judging based on anything superficial is beyond useless. We all have a story, and it’s one worth listening to. That's exactly the message you conveyed! How perfect! You mentioned earlier that you would write a little bit here and there and came back to The Wild Wood years after actually writing down parts of the story. When it came down to turning your pages into a novel, which part was the hardest for you to write? The word “hardest” can be taken in a couple ways. Sometimes the writing itself is hard, and sometimes the emotions we have to go through to write something are hard. I would say that the hardest part to write from the writing standpoint was the beginning, deciding where exactly to begin the story. I went through more than twenty beginnings before falling in love with the one I ultimately went with (I love Dusty more than almost any character I’ve ever written, and his part of the beginning cracked me up). The most difficult emotional moment to write was a small, simple moment, but I tear up every single time I read it. Since it won’t give anything important away, I will share it. It is the moment when the town leader pulls Cecily in front of the townsfolk and tells everyone that she is no longer a member of their town, that she is foreign in the only place she’s ever known, among the only people she’s ever met. That scene broke my heart! I hated Pastor Rowe so much and his ignorance just really irked me. I'm not even going to say he was afraid of the Sevens, he was just a bully who used his town status to create unnecessary fear. Of course, we're not supposed to like him so I guess me wanting to kick him isn't a huge deal. Without getting too spoilery, you really wove an intricate backstory for these characters and there were a lot of surprises as the plot moved along. Did you plan all of this ahead of time or did it just flow as you continued to write the story? Honestly, I never know where my writing is going until I write it. I might have ideas about the future of the story, but they are often wrong. I just write and see where things go. I know I am on the right track when pieces start clicking together as though I had planned them that way all along. This makes the writing process more nerve-racking because I honestly don’t know who is going to live or die until it happens. In some of these instances, you hinted at things from the past that dealt with the other Sevens. One of the particular scenes that comes to mind is when "Stephanie" looks at Lille and thinks "Please don't let her find out..." Will you be divulging more of these back stories as the series goes along? Absolutely. Since the first book is written in first person, we really only know the inner workings of Cecily. That changes in the second book (and the rest of the series) which allows for other perspectives, including Morgan, Stephanie, and Dusty, while still following Cecily’s journey. Along the lines of additional perspectives and book two, I saw that The Downs and The Barren Way are already out, but I didn't see any link for a book 4. Is this series a trilogy, or can we expect more from Cecily and the Sevens? Book 4 (The Deep East) comes out this December. Because of the Sevens theme, I thought a seven book series would be appropriate, but wasn’t sure if the story world was big enough to sustain that. Now that I am four books in and can see the magnitude of the story world, I don’t think it is going to be a problem at all. I will say that while I am excited to get to the end and see how all of this works out for these characters I love so much, I can already feel how difficult it is going to be to let them go. But there are a lot of other stories I have written or want to write, so I will keep myself busy. What are some of your literary inspirations? Favorite books/authors? I love C.S. Lewis, J.R.R. Tolkien, Nick Bantock, L.M. Montgomery, Jane Austen, and Han Suyin. But I love any writer who can pull me into their story and make me forget the real world. I love creativity and hope in books (sometimes it is hard to find books lately that have much hope at all... yikes, I need my fictional hope!). I love the writers who manage to capture a character who is so universally understood that a hundred years after the writer’s death, people are still picking up the book and connecting. For me, writing and reading are all about connection with what it is to be human and part of a community larger than we will ever know. My biggest dream is for a future reader to pick up my book in a hundred years and smile at Dusty’s floppy hair or Stephanie’s princess-in-training attitude, to connect with this world I’ve been so happy to get lost in. I for one will be recommending this book for years. It's such an intricate novel with surprises around every turn. Thank you for stopping by Bookish and writing this amazing novel! I'm excited to continue with this series and see where you're going to be leading the Sevens next. 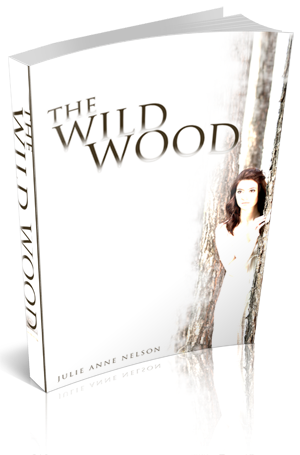 Julie is graciously giving away one signed copy of The Wild Wood and a $10 gift card for Amazon to one lucky Bookish reader. Do not cheat as I verify all entries. Nobody likes a cheater anyway.